I have been waiting a long time to do my sushi entry! I have only been eating sushi for a few years, so I by no means consider myself an expert, but it doesn't take an expert to know good food. My first experience with sushi was in college: I was going to my night class and needed to find some quick and class-friendly dinner to eat. I headed over to the Metro Market and, after much searching, decided to venture for some sushi (which only a few years earlier I refused to eat). This sushi was great! I loved it and continued to eat it over the next few years. 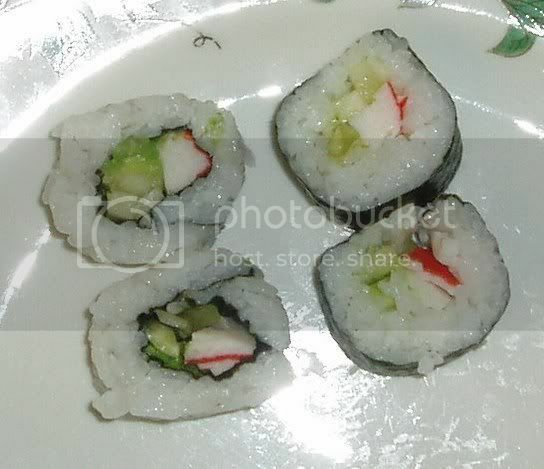 However, until I graduated, this was my ONLY experience with sushi - from the grocery store. Now..time for the pictures and reviews! This is a great little place, and by little I mean it's a small round kiosk-like restaurant in the middle of a hallway. And by hallway I mean a really large hallway in the Mall of America! Tiger Sushi is small, but it has great food! You can come in and eat at a table and see a 360 view of the mall, or you can go to their express station and grab some pre-made sushi to go. I'm sure all of their sushi is just as great as the last, so I would say go for your favorites, but I have to highly recommend that you have their miso soup! This place honestly has the best sushi I have ever had. It is so good that I can hardly seem to enjoy sushi anywhere else! It's about 2.5 hours from where I live and I have already been there three times since March of this year. I always mean to take pictures of the food, but get so wrapped up in enjoying it that I plum forget! Anywho, I always get the Tuna Tataki (which I don't have a picture of from this place), but last time I was there I got the Crunchy roll and the Rock N' Roll (pictured below). They of course were fantastic. So fresh and full of flavor. But don't ask the waitress what she thinks, she thought the crunchy roll was like an egg roll! JMK is a sushi bar, karaoke bar, and hibachi. It it also decorated gorgeously with an indoor/outdoor koi pond in the entrance and kimono and tea ceremony sets displayed in the entrance. 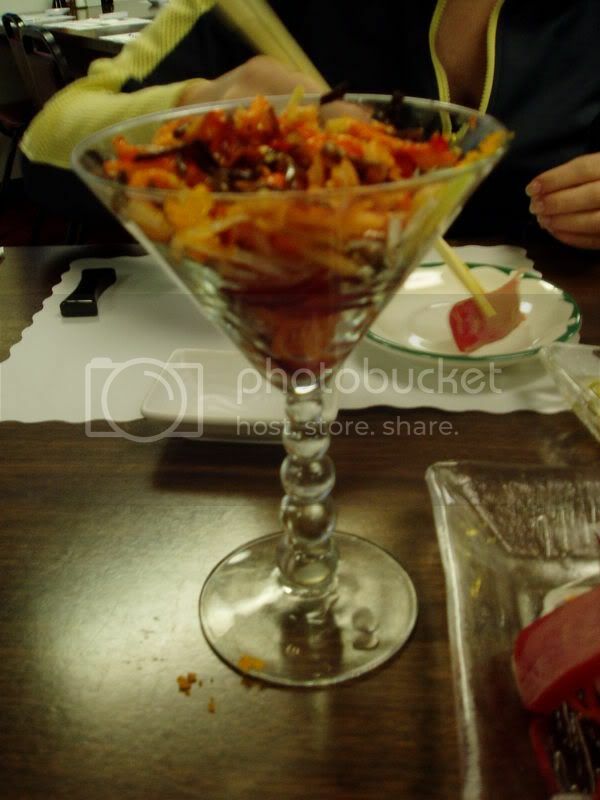 This place I heard was the best place in Kenosha to get sushi. So good in fact that people drive up from Chicago just to go to this place. At first glance, it looks like a dive bar (inside and out). However, I was pleasantly surprised with the food and service. 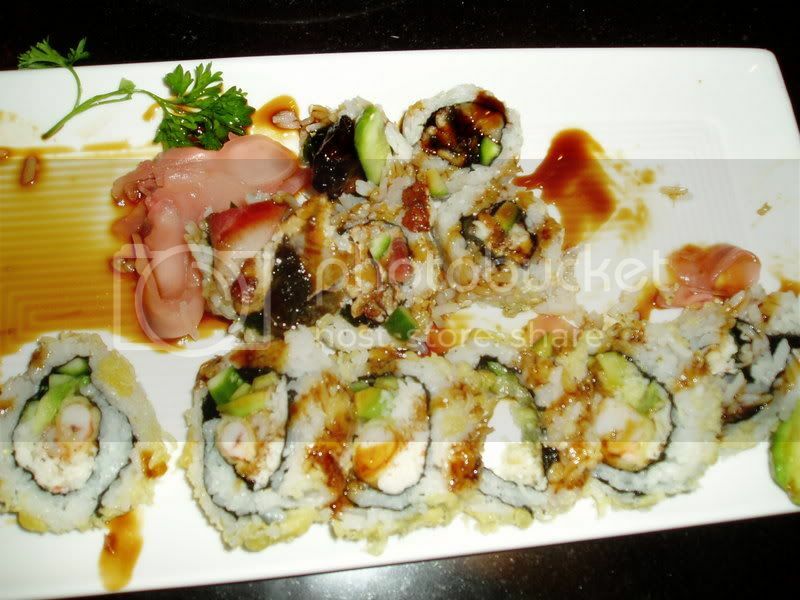 The owners also cook and service the restaurant and are friendly and always ready to make a recommendation. This place also seems to have a pretty steady set of regulars. As for the food, it's not too bad, it still didn't stand up to JMK, but it was pretty good and I would go back to try more. 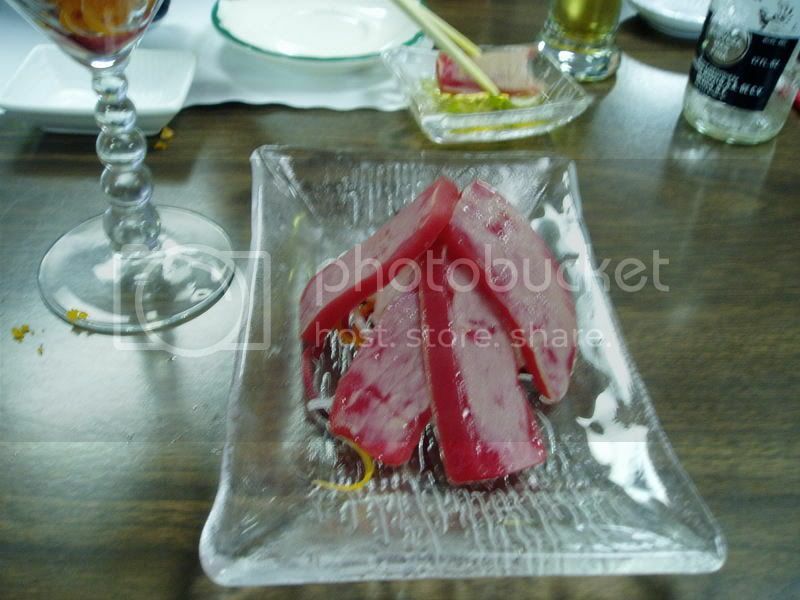 I don't remember what rolls we had, but we also tried their Tuna Tataki (pictured below) and their famous Squid Salad (pictured below). Out of those two, the Squid Salad was very good, but I felt the Tuna Tataki was laking in flavor. My husband was determined to make his own sushi - down to the sticky rice. However, he wasn't sure how to do it, so I told him to go to YouTube and find a video, and he did, and this is what happened.. It was pretty good! He made the Philly and the Cali roll. We had some friends over that night who weren't that interested in sushi before, and they even liked it! The hardest part was making the rice, but it was worth it. I suggest you try. For those of you unfamiliar with sushi, eating sushi does not mean you are eating raw fish. Sushi refers to the special rice used, so don't be so scared to try :-) Many places even serve vegi rolls to get you started. However, if someone offers you Sashimi, you are for sure eating raw fish.